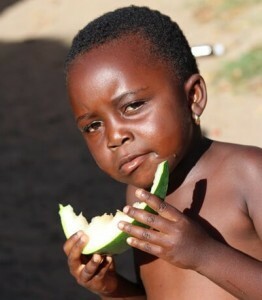 On a sunny afternoon Neema is enjoying a watermelon outside her home at Kabangaja Village. She was not expecting any visitors, but Neema quickly turned into a perfect hostess by ‘cooking’ a special meal for a film crew that visited the house she lives in with her parents and siblings, in Ilemela District. In her generous and creative mind, a mixture of sand and water represent ‘ugali’ (a staple in here community), eaten together with green vegetables (a few leaves from a nearby plant placed in plastic containers. The film crew, Frame X Frame, was in Tanzania to document Children in Crossfire’s work in its impact districts within Kilimanjaro, Mwanza and Morogoro. Children in Crossfire partners with local organisations—Maarifa ni Ufunguo, Tanzania Home Economics Association (TAHEA) and Child Development Trust Fund Network (CDTFN)–to ensure that young children’s early development is supported increasing their chances of meeting their fuller potential as they grow up. Directly working with 35 community preschools and 135 pre-primary classes across government primary schools, we support teacher training and mentoring in early childhood education, the set-up of stimulating learning environments including learning materials and locally-sourced play materials, as well as integrating aspects of nutrition, stimulation, care and protection. Annually our Early Childhood Development (ECD) programmes are reaching more than 13,000 young children like Neema and priming them to be ready for school. While CiC focuses on Neema and others in Tanzania, the international community’s attention is also on her and all children in her age range, due to the potential they hold to transform their respective countries and communities around the world. It is estimated that 43%—249 million—of children under five in low-and middle-income countries are at an elevated risk of poor development due to extreme poverty and stunting. This represents a tragedy of lost opportunity and potential, given according to the Lancet Series titled, Advancing Early Childhood Development: from Science to Scale that was launched in 2016, children in the early years have the best chance of maximising their potential when they are well nourished, responsively cared for, with learning opportunities from birth onwards, and protected from disease, violence, and stress. This year’s Day of the African Child’s theme is “The 2030 Agenda for Sustainable Development for Children in Africa: Accelerating protection, empowerment and equal opportunity.” The theme responds directly to the call and recommendation from the Lancet that the time to act is now! This is the market place in an ECD classroom in Ilemela, Mwanza. Individuals are estimated to suffer a loss of about a quarter of average adult income per year, while countries may forfeit up to as much as two times their current GDP expenditures on health or education. Therefore, if we act now, Neema and other children her age will be equipped to produce better world citizens in the future, with higher average income who are overall balanced to protect the planet and maintain peace. Neema will be a responsible 17-year old when the world takes stock of its SDG performance in 2030. The foundation to ensure that she reaches her full potential when she grows is being set right now by her parents, teachers and all stakeholders in ECD. Let us all play our part by joining the movement to invest in our children. Happy Day of the African Child Day!